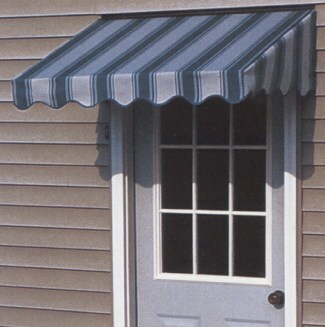 FutureGuard Fabric Door Canopy Custom Canvas Co.
Protects door and entry from the elements. Bronze finish framework will never rust. Available in over 50 fabric patterns and colors. Adds beauty and value to your home. Shipped partially assembled with all necessary hardware for quick and easy installation. Canopies available in over 50 fabric solid colors or striped patterns. Step 1: Select the projection that best fits your needs available in 24" to 48" in 6" increments. If mounting over a door that opens out use at least a 42" projection. Step 2: Measure outside width of door casting. Add at least 3" - 5" on each side for proper appearance, be sure that you don not have a light fixture or other obstructions in the way. Custom widths up to 240" in 1" increments. Step 3: Canopy Supports: Measure from top of door to determine available space for mounting. Sides require 13". Step 4: Select the Fabric color and pattern choice that best compliments your home. All canopy framework is in Bronze Finish. See fabric selection. Sides require 13" mounting space above the door. All orders Shipped: Partially Assembled, Shipping Prepaid within 14 Days. Pricing Example: 2700 Series for Model #5 - 86" wide - Multiply 86" x $4.46 per inch.